Ashrafia Introduction by Ashrafia's President and CEO. 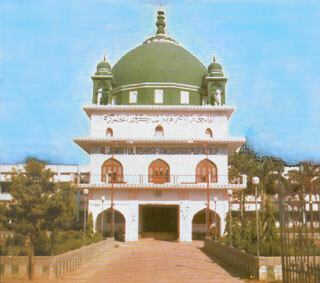 Azize Millat Hazrat Allama Ash Sah Abdul Hafiz Sahib Qibla Damat Barkatuhumul Aalia. Hafiz-e-Millat was Born on Monday at Bhojpur , Moradabad U.P. 1313 A.H. / 1894 A.D. Completed Hifzul Quran Course at Bhojpur Moradabad U.P. 1396 A.H. / 1976 A.D. Sad demise on Monday 1st Jamdil Akhira at 11:55 P.M.
1396 A.H. / 1976 A.D.